Whether you are planning a trip to Key West, decorating a cottage in the islands, or just indulging in a little armchair travel, Key West Décor will create an atmosphere reminiscent of sea breezes, open ocean, and palm trees. If your budget doesn’t run to trips to the beach this year, you can still relax in the attitudes of the islands and a getaway shielded from the world. Pictures create atmosphere in ways that are unduplicated by any other medium. Travel posters, tapestries, little sculptures and even rugs can create that visual impression that will take you away from the workday world and let you relax and escape for at least a little while. Nothing says tropics like wicker. Wicker is a style of weaving that can be used to make furniture, baskets, mats and more. The material used is often palm or seagrass fibers. Any tough flexible material can be used to create wicker weaving. Best of all, it is lightly flexible, creating a comfortable place to sit that breathes and gently gives with your weight, making it more comfortable than a wooden bench and much, much lighter to move. If responsibility or budget have you grounded this vacation season, take your enjoyment where and how you can. Recreate a pirate’s den or oceanside getaway with a few easy props. Use LED lighting to simulate the clear, tropical sun. Luxuriate on a thick rug that has a nautical theme, and relax on a wicker chair embellished with throw pillows printed with beach scenes. Add a potted palm or two, and a rich tapestry of sailing boats or the ocean and you are all set to travel. If that isn’t enough ambiance, contemplate a vintage travel poster or two. Or develop your own vacation theme or ideas. You can look through the list of Key West Décor ideas below to get ideas about creating your own little paradise. Even if you only have thirty minutes at the end of a busy day, you deserve to have a place to enjoy yourself. 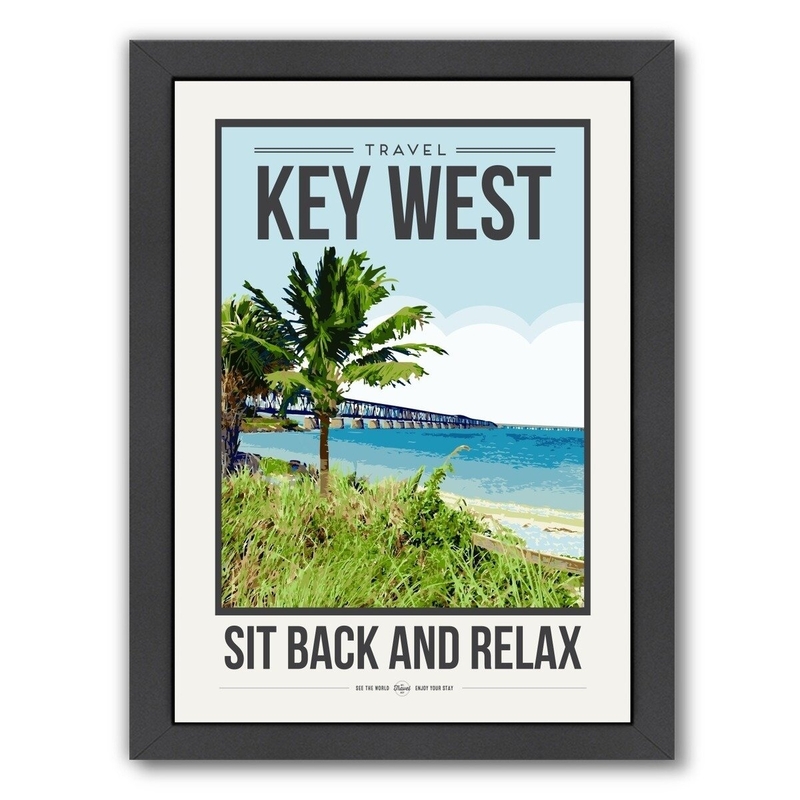 This is a beautiful travel poster of a white beach, palm tree and green grass, with sage advice, “Sit Back and Relax.” The top of the poster reads, “Travel Key West.” Even if you are strictly an armchair traveler, this lovely photo will rest your eyes and help you take its excellent advice, or it could be a goal. Light up your entryway with this Key West LED pendant light from Wade Logan. Enjoy dimmable clear light without the heat usually generated by incandescent or fluorescent bulbs. The fixture is a chrome colored circlet suspended on three slender cables. Add a woven mat, a couple of mirrors to pick up the light, and you have an entry that says “welcome” in any language you care to name. Seeing this is an immediate transportation to Larry Niven’s accounts of “Cargo Culture” in Dream Park. Or perhaps for those who read less fantasy, you might think of palms and ocean breezes. Beautifully woven from seagrass, the wicker weaving creates a secure but airy container. It’s excellent for items that need protection but also need to breathe. Enjoy the richness of a fabric wall hanging with this lovely Key West hideaway tapestry. Attached to a rod that is decorated with Fleur de Lis ends, the beautiful tapestry depicts a cottage glimpsed through a stand of palms. A small sailboat in front shows the favorite mode of travel to reach the house. Another small cottage can be seen in the distance. Imagine yourself in the warm tropics with a pleasant breeze coming in off the ocean as you sit on lime green upholstery and recline on soft throw pillows that top the dark brown wicker of this pretty love seat. If your weather doesn’t lend itself to outdoor lounging, add a couple of potted palms and an “ocean breeze” aromatic candle. Imagine yourself on a cruise ship where ladies stroll carrying parasols while leaning on the arm of gentlemen wearing white ice cream suits. This vintage Key West Island Charters poster shows a white cruise ship with a tall, black smokestack. Below the picture is a list of the anticipated cruises available. It takes very little imagination to see yourself on the promenade deck of such a ship. Make your favorite captain or pirate’s day with this blue and beige area rug. A ship’s helm wheel is depicted at the center of the rug, while around the outside edge is a frieze of land and water scenes that include sailing ships, lighthouses, puffy clouds and ocean. Your sailor will enjoy this rug in a study or other private space. A tall, rustic sign post overlooks a Key West rocky promontory. The tips of sailing boats are just visible above the tough grass around the foot of the sign. The signs attached to the post read things like, “London, 4565 miles; Paris, 4707; Miami, 132 miles.” There could scarcely be a better way to say “A million miles from nowhere,” which is where some people would love to be at all times. Enjoy your afternoon nap with your head on this tan and white pillow polyester throw pillow. The print pattern woven into the fabric displays sea shells and starfish. The pillow is stuffed with polyester fiberfill for no-crush comfort. You can easily imagine yourself at the beach – without the sunburn or sand in your shorts.